So glad you followed up on last week's post, Diane (which I mentioned in mine today, by the way). 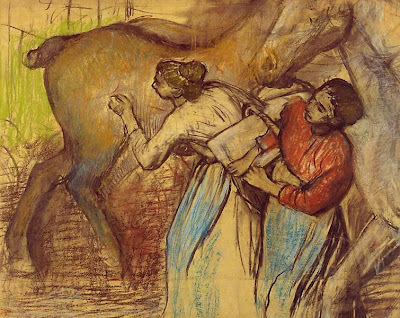 I wasn't familiar with this Degas and find it really intriguing - and your wonderings about it, too. Maybe the horse had a grass stain on its flank and she couldn't help herself? Horses AND laundresses...what are the chances?!? Thank you, Ladies. It is a great picture, isn't it? And we're so lucky to be able to find these works online. I think maybe Degas was having a little fun with the laundresses!